Knex Technology, a consulting firm based in Irvine, California, helps companies architect, integrate, implement and tune cloud applications to drive business success. For example, Knex is currently helping a large pharmaceutical company tie together multiple business systems including their financial, procurement and project management applications to improve operational agility. Using a combination of Oracle Java Cloud, Oracle Database Cloud and Oracle SOA Suite, Knex is integrating financial data across multiple systems including ingesting bank account information into their financial application for streamlining cash management. 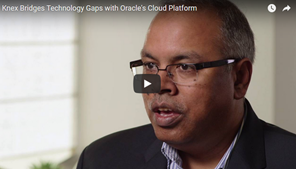 Listen to Basheer Khan, CEO of Knex Technology, talk about how they save customers time and money by using Oracle PaaS solutions to integrate, extend and enhance SaaS. Read the complete article here.